Bob Richards, director of Belfast's public works department, walks into the addition to the Belfast Fire Station on Tuesday evening. 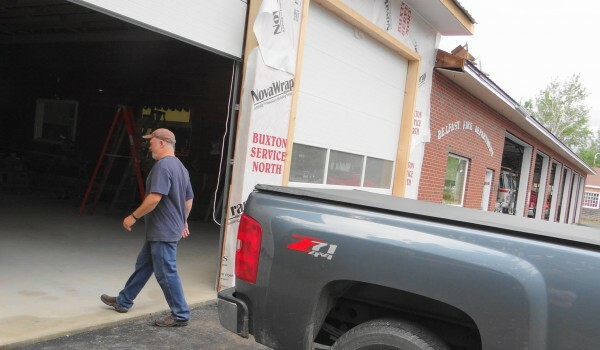 The Belfast Fire Station has been expanded with two new bays, built collaboratively by the city's public works department and a private contractor. BELFAST, Maine — In these leaner times, the city thinks of any capital project in DIY terms first. “If we can do it ourselves, we do,” said City Manager Joe Slocum. That’s the approach the city is taking in expanding the fire station on Main Street near the U.S. Route 1 overpass. The “hybrid” project, as Slocum calls it, involves a private contractor and the city’s Public Works Department. The goal was to allow the department to park its new aerial truck in the station, but because the vehicle is about a half-foot higher than the ceiling, the city faced a choice. Modifying the roof of the building, which was built in the late 1980s when the department relocated from City Hall, would cost about $50,000, Slocum said. Adding two more bays to the building, using city crews to do some of the work, will cost $95,000. The city chose the latter option. The City Council waived its bid policy, which stipulates that all work over $4,000 be offered to competitive bidders, and at Fire Chief Jim Richards’ suggestion negotiated with Mitch Brown Construction, a local firm. For an outside contractor to complete the project, the price tag would be about $150,000, the manager said. The public works crew provided all the site preparation work, including scraping off the existing paving in the parking lot, moving flag poles, ditching, dumping fill and helping with the foundation of the new structure. Volunteer firefighters also have helped. Slocum said one firefighter used vacation time from his job to help out. “We’re thrilled with the quality of the work,” he said. Slocum noted that since the late 1980s, the vehicles the department has purchased are larger. And instead of housing just one ambulance, the city now owns three. It also has a boat on a trailer to respond to water emergencies and an ATV. The ambulance service in particular, which Richards also oversees, has grown, Slocum said. It provides service to several other towns and employs four full-time paramedics. The ambulances provide patient transfers to hospitals in Bangor and Portland. Slocum praised Richards, who has headed the fire and ambulance departments for several decades. “Jim Richards has done an unbelievable job for the city of Belfast,” he said. While like-sized communities have large staffs in fire and ambulance departments, Richards has relied mostly on volunteers. The city’s latest budget draft, Slocum said, sets aside money to hire a full-time person to assist Richards and perhaps learn the ropes from him. That person someday may take over the reins, the manager said. The work on the fire station is slated to be completed by September.